Another casual look that I attempted to dress up with patent wedges and a lace top. for too much longer since consistent warm weather should technically be arriving soon. PS. I just these shoes on sale last week at J.Crew. I would recommend checking out the store first. Great classic look, you look amazing, and I love the contrasting colour of your bag! your outfit is just too cute gorgeous girl! I know, I'm so stoked to be visiting Tortola! We're going in June...can't wait! I'm actually in California right now but I was living in Manhattan with my boyfriend in the fall while I was working at a magazine. I'm moving back in August to start NYU grad school, you'll have to let me know if you move ! Love this outfit! Great for any day and I love that purse. 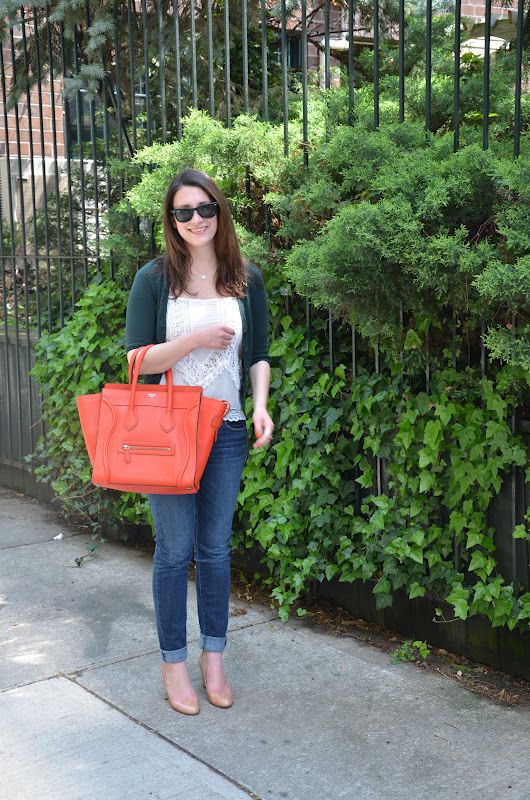 Love the bright orange bag! I just ran across your blog, and will be a follower for sure! You have great style, and I can't wait to see more!